North Korean soldiers leave after paying their respects to the bronze statues of their late leaders Kim Il Sung and Kim Jong Il at Mansu Hill Grand Monument in Pyongyang, North Korea (Dec. 17, 2018). The Japanese government is seeking to elevate the issue of human rights in North Korea, even as United States-led negotiations on denuclearization appear to be faltering. Of particular concern to Tokyo is the fate of Japanese nationals abducted by the North Korean agents in the 1970s and 1980s – a regular feature of Japanese diplomacy over the past year. A government-organized symposium, held in central Tokyo on December 15, sought to wrestle with the vexed issue of how the international community could pursue an improvement in human rights in North Korea when diplomatic efforts have mostly focused on trying to reduce the nuclear weapons threat. Chief Cabinet Secretary Yoshihide Suga, who has ministerial responsibility for the abduction issue, opened the conference by describing North Korea’s human rights abuses as a common challenge for the global community. He noted that a United Nations-established commission of inquiry warned in 2014 that the gravity, scale, and nature of those human rights violations had no parallels in the contemporary world. They included crimes against humanity. Though we and the abductees presently suffer and have suffered these many years, millions of innocent citizens of North Korea continue to suffer under oppression, punishment, abuses, malnutrition, fear, and other unspeakable tortures brought upon them by their own government. The conference then heard the views of a panel of experts on how to raise the human rights issue. Revere noted that the United States had imposed human rights-related sanctions on three senior North Korean officials earlier this month. But he said the United States and other governments would need to take further action to improve the human rights situation and obtain justice for abduction victims. 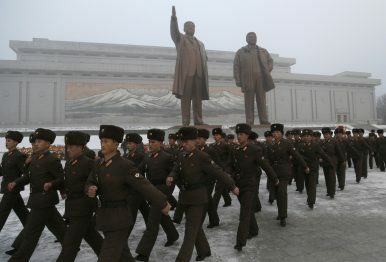 Governments must systematically integrate the issue of human rights into their dialogue with North Korea, Revere argued. Sanctions should be tailored to focus on the international travel and personal fortunes of the regime members responsible for human rights abuses, he said, while greater efforts should be made to raise the issue of human rights in the UN Security Council. Revere described the first summit between U.S. President Donald Trump and North Korean leader Kim Jong Un in Singapore in June 2018 as ill-advised. A second summit, which Trump has mooted for early 2019, would be “even more ill-advised unless the two sides can agree in advance what the agenda is and what the outcome of the summit will be.” Revere said it should be made clear to the North Koreans that while the two sides were talking about denuclearization, they were also talking about the improvement in bilateral relations if critical issues could be resolved. Human rights should be put on the agenda in this context, he continued. If North Korea wants prosperity instead of nuclear weapons then Japan is available for negotiations but at the same time the North Korean leadership has to be ready to pay the price to persuade the Japanese government and its people to agree upon supply of economic assistance on a massive scale. Ritsumeikan University law professor Kimio Yakushiji said Japan should continue to pursue the human rights issue via UN avenues. As part of that effort, a plenary meeting of the UN General Assembly this week adopted a resolution jointly tabled by Japan and the European Union. It’s the 14th consecutive year that the resolution condemning North Korean human rights abuses has been adopted – but it seems that, yet again, a potential breakthrough in the on-the-ground situation remains out of sight.